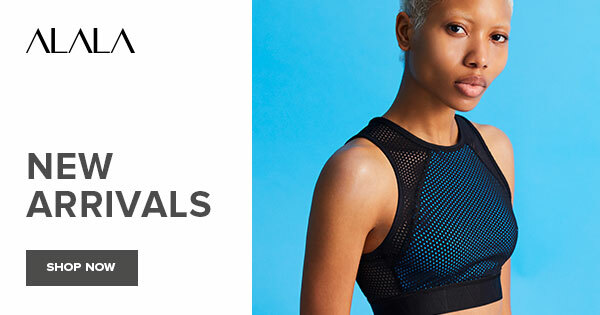 Women's Alala fitness, workout, and yoga apparel for sale online in a variety of styles including bras, jackets, and sweatpants. ALALA CAPTAIN CROP TIGHTS in Black and Bone: Knock them out with our best selling tight. With sheer mesh panels across the back of the knees, you'll look as amazing going as you did coming. ALALA MIRAGE CAMI BRA in Black Mesh: Create the ultimate illusion with our Mirage Cami Bra. Sheer rib detailing shows off just the right amount of skin. ALALA MIRAGE TIGHTS in Black Mesh: Defy the norm with our most innovative tight yet. Ribbing creates a sophisticated look, while side pockets comfortably fit everything in your bag of tricks. ALALA SCORE SEAMLESS TANK TOP in Navy Blue: Settle the score in our new fitted tank. Any easy racer back with chaffe free construction provides optimal protection for a life in motion. ALALA SCORE SEAMLESS TIGHTS in Navy Blue: Even the score with the newest arrival in our seamless range. Tonal blue hues and colorblocked detailing will set you apart from the competition. ALALA CAPTAIN ANKLE TIGHTS in Black: Knock them out with our best selling tight. With sheer mesh panels across the back of the knees, you'll look as amazing going as you did coming. ALALA ESSENTIAL SEAMLESS BRA in Black: We're obsessed with our seamless bralette. Featuring a comfy no-seam construction, signature Alala band and an open mesh back, this bra is perfect for any activity. ALALA ALL DAY TIGHTS in Black: These tights are perfect for everything you want to do all day. A cozy fabric makes them great for chillier days while a black side panel adds a touch of shine. ALALA ALL DAY JERSEY in Black: Get after it all day in our oversized mesh jersey. Made with a semi-sheer basketball mesh and our All Day decal, this tee will bring a hint of cool to your workout wardrobe. ALALA CROSS BACK BRA in Black: Can we just call it: this bra is everything. With a high neck and cross back straps, our new favorite is the perfect mix of sporty and sophisticated. ALALA NOTCH SHORTS in Black: Hit your mark no matter what the conditions in our latest short. Plush terry merges with crisp cotton creating the ideal synthesis of comfort. ALALA NOTCH HOODIE in Black: Up the ante in this ultra-soft, oversized pullover, and complete the look with our Notch Short. ALALA NOTCH HOODIE in White: Up the ante in this ultra-soft, oversized pullover, and complete the look with our Notch Short. ALALA WHITE NOTCH SHORTS: Hit your mark no matter what the conditions in our latest short. Plush terry merges with crisp cotton creating the ideal synthesis of comfort. ALALA ZEPHYR JACKET in Navy Blue: A cozy fleece with the appearance of denim, our Zephyr Jacket is the new standard. ALALA SCORE SEAMLESS BRA in Navy Blue: Lightweight. Smooth. Comfortable. Flattering. You already know the score. ALALA TRANQUILITY TUNIC in Black: Cut oversized, our dolman style mesh back tee brings a little toughness to this basic silhouette. It's the easiest throw on piece after your workout. ALALA HARLEY TIGHTS in Black: These moto-inspired tights add the perfect amount of luxe to your workout wardrobe. The Harley tight is this season's signature style. ALALA VAMP TIGHTS in Black and Velvet: A more luxurious spin on traditional tights, these velvet tights will have you embracing your inner ingÃ©nue. ALALA BARRE SEAMLESS BRA in Black: For plies, Pilates and everything in between. Our newest bra is made to move. ALALA OPEN UP MESH TEE in Black: Hint at some skin in our paneled mesh tee. This style is meant to be layered and will keep you cool no matter what you get up to.